i had an itch to do a little baking, but ended up doing a lot. i originally started with a few cookies from "baking: from my home to yours" by dorie greenspan; although her cookie recipes are very good, and they turned out well, i don't think i'm a cookie kind of gal. i asked you what i should bake, and boy, y'all responded. acornbud turned me onto hawaii's version of a dream cake, which is layers of chocolate chiffon cake with a whipped cream frosting and decorated with chocolate curls. 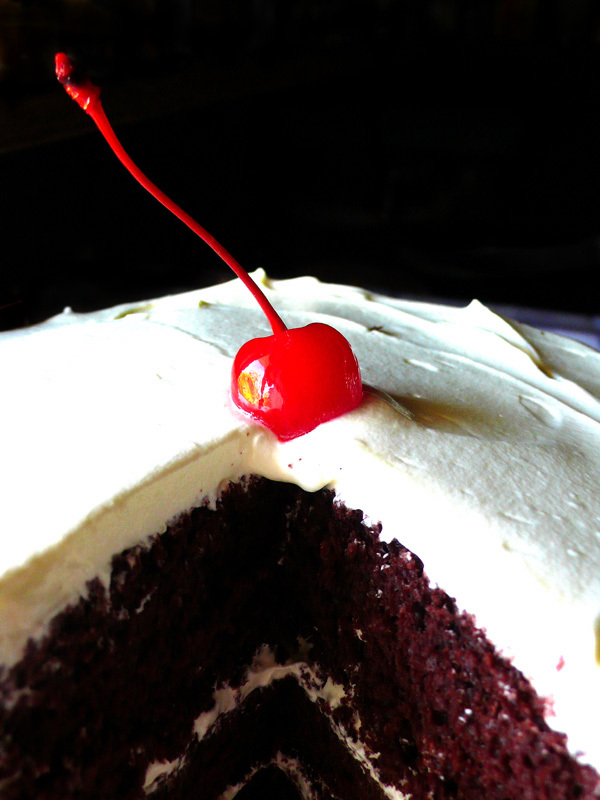 i had never heard of it, or most likely, mistook it for a black forest cake (it looks remarkably like the popular devil's food white out layer cake from that dorie greenspan book i previously mentioned). as i normally do when it comes to hawaiian-style recipes, i turned to betty shimabukuro's "by request" column, which produced this gorgeous not-so-little cake. 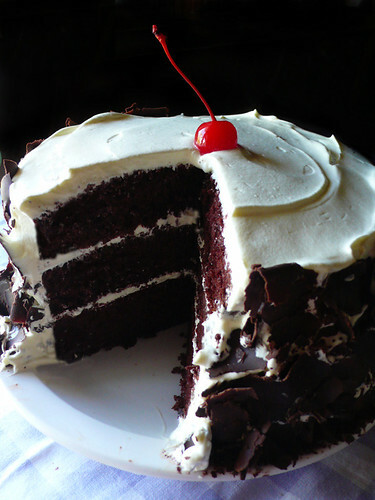 having never had a dream cake before, i don't know how it compares to others, but i found it to be moist, light in texture, but rich in flavour and therefore ono all the way. 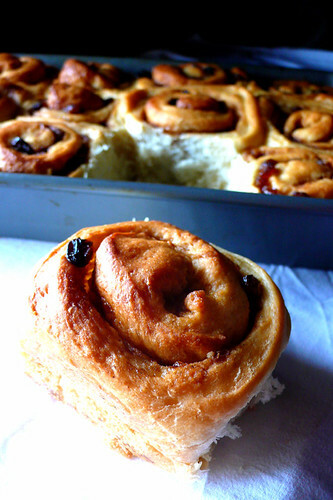 another thing i hadn't heard of previously was chelsea buns, as requested by miss saffron. 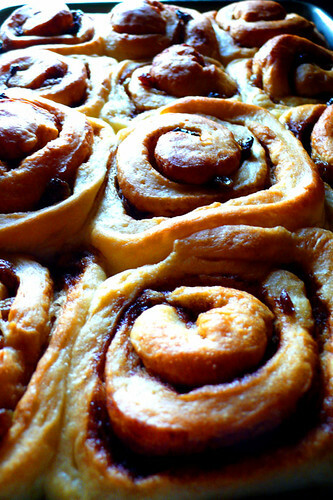 chelsea buns, i've read, are similar to cinnamon rolls only made spicier with with the addition of a little bit of lemon zest in the dough and cardamon. i went ahead with a mod of my favourite cinnamon roll recipe, with the addition of the zest in the dough, currants, golden raisins, cardamon, two kinds of cinnamon and muscovado sugar in the filling. no one suggested it, but i swear somehow akatsukira's, saffron's, or bowb's culinary adventures influenced my decision to make a victoria sponge. depending on what you read, the victoria sponge grew from either queen victoria's hunger for a little somethingsomething in the afternoon because apparently luncheon menus had become quite meager, or because she was encouraged to host tea parties as civic duty. 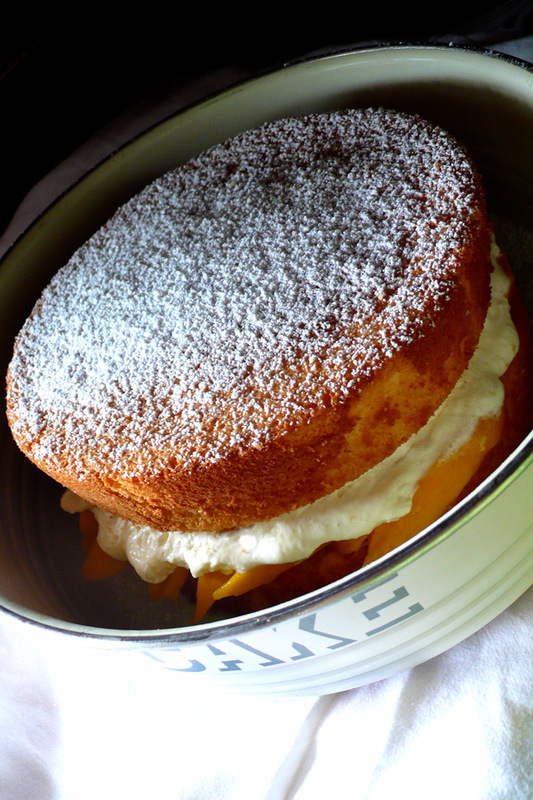 whether borne from low blood sugar or civic pride, a traditional victoria sponge is not actually made from a true sponge cake which does not incorporate any fats within the cake; it is made by sandwiching two butter sponge cakes (obvs sponge cakes with butter in the recipe) with layers of jam and heavy cream (clotted or double cream, i imagine). for my victoria sponge, i decided to use a traditional sponge recipe, as most recipes i found for butter sponge involve self-raising flour which i didn't have, and because my family prefers an eggier, dryer cake (is that a somewhat specific asian upbringing thing? umami and i seem to think so). the recipe i used is tricky as the only leavening is the whipped egg whites, and darned if folding in the yolks and the flour isn't the biggest baking b***h i know, but it's worth the effort if you like a bit of a freak out and a fluffy, eggy cake. 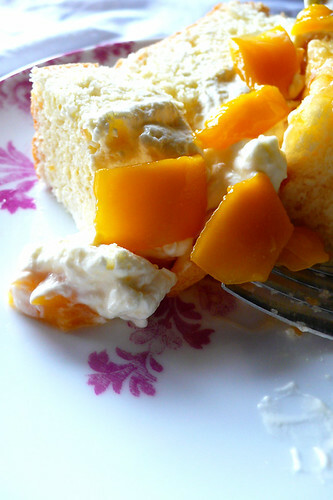 i sandwiched the cakes with a layer of mango jam, far too many sliced, superripe philippine mangoes, and an extra-generous slather of whipped cream to make up for the lack of fat in the cakes. too much fruit and cream=somewhat unattractive presentation, but also =incredibly tasty cake. j said that this is exactly the cake he wants at his wedding so yay! that covered zarah maria's suggestion of a wedding cake. next on the list: anne's suggestion of an ube cake or sans rival, anthony's somewhat perplexing request for a shaped german cake without a hole, robin's lemon or orange cake (might have to actually request a recipe for the orange crunch cake from betty), and maybe throw in a tall cake for saffy as well. add water, milk, butter, eggs, and vanilla together. in another large bowl, mix the lemon zest and dry ingredients. make a well in the center of the dry ingredients and pour the wet mixture in. using a wooden spoon, stir everything until it forms a wet, sticky dough. keep stirring until the mixture has pulled away from the side of the bowl. tip the dough out onto a floured surface and with floured hands, knead the dough (adding flour if necessary) to shape it into a manageable ball that is still flooby and a bit sticky. place the dough in an oiled bowl, cover, and allow to double in size in a warm place. punch down, divide the dough in two. using a lined half-sheet jelly roll pan as your guide, roll and shaped a ball of dough to fit the size of the pan (i think it's 18"x 13"). spread half the filling mix (although i tend to use less--YMMV) onto the dough, leaving about an inch on one "long" side clean. sprinkle dried fruit over the filling. tightly roll the dough up lengthwise to the clean side, then use your fingers to pinch the dough seam closed. cut the dough into 12 equal portions (or whatever you can get out of it), arrange the pieces in a greased rectagular 9"x13" pan. repeat with the second ball of dough. cover pans and let rise until doubled. 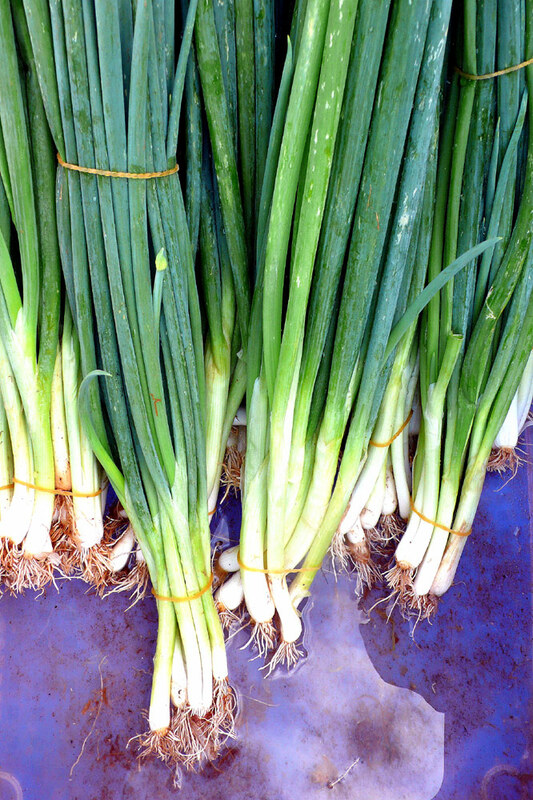 bake in a 335°F oven for 20-25 minutes. drink more pea-protein derived liquor! 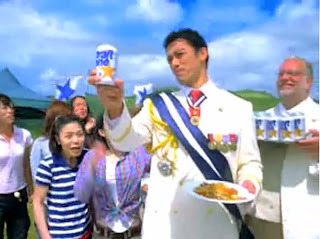 props to the saipan blogger for his self-described 0.15 seconds of fame as an extra in this sapporo draft one advert. as he says, it's not really beer, but "beer flavored liquor made from pea protein." mmmmmm. sounds, um, tasty. kanpai! you make me feel like dancin'. 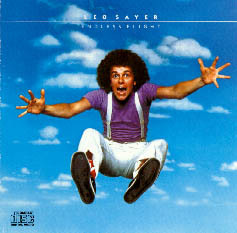 there's nothing like a little leo sayer reference. besides baking. i feel like baking. any requests?